Every Spring, when it comes time to gather as Everywoman again, I can’t help but be filled with so much joy as I watch the forecourt of Oxford Falls filling up with women of every generation. I love seeing those that are gathering with their Mum’s, Nan’s, Daughters and Granddaughters as we venture together on a beautiful weekend once more. It’s a precious time to hit ‘pause’ on our overflowing schedules and get away together. Last year in particular I loved witnessing a photograph being taken of a family of 4 generations; Nana, Daughter, Granddaughter and Great Granddaughter! There was something so precious about this moment - what a legacy. How blessed they are to be bringing so many generations of women from their family together for the Everywoman Gathering. Overseeing Everygirl is not something I take lightly. Having grown up in the House of God since I was a tiny babe, I have experienced first-hand the power of bringing your children up in the House of God. Taking every opportunity for them to experience Jesus for themselves, and helping them come into their own relationship with Him. I remember as a child finding my first love in Jesus, asking him into my heart as a three-year-old girl and feeling so safe, feeling that nothing could get to me or harm me. Later on, at nine years of age, I had my first big encounter with God and received the gift of speaking in tongues. It was a moment that has and will stay with me forever. Children experience and have deep connections with Jesus more than we will ever understand. I believe that in today’s world more than ever, with so many challenges children must face, they need that connection with Jesus. A relationship with Him that will carry them through those moments of life that could have easily taken them out. Having girls come to Everywoman across all generations is what the Everywoman Gathering is all about. Stacie along with her husband Nick LaGreca are the Kids and Families Pastors at C3 Oxford falls. They are parents to two beautiful kids, Carter and Briley. 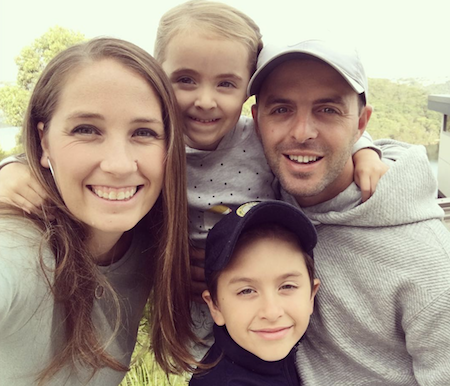 Stacie is passionate about families being raised in the house of God and believes in the power of Everygirl to transform your little girls personal relationships with God in a real, practical and powerful way. Everygirl is a place where these beautiful young girls can have so much fun, make friends, worship and listen to messages that will dare them to dream and have hope for their future, because they know that Jesus is truly with them in their heart. This year, like every year, we are believing for your girls that they will have encounters with God that will never leave them and cause them to never be the same again. We are believing your girls will be filled with the fullness of Christ and His presence, with overflowing peace and joy from heaven. That is what our heart is for Everygirl 2018.